Itâ€™s a big day for Daniel - heâ€™s about to test a teleportation device heâ€™s been building for the last few years. Will everything go as planned, resulting in a stunning breakthrough in modern science, or is he, as it so often happens in situations like this, going to end up in a parallel universe, where magic and fairies are pretty common, while cell phones and sneakers arenâ€™t? "A most satisfying fantasy tale with two playable characters and a lot of little touches that bring to mind the works of Hayao Miyazaki. Fun, good-looking and sounding point&clicker that will satisfy in particular the players that put characters, pacing and atmosphere above challenge and gameplay complexity." Short but beautiful game, fun to control two characters (although not much interaction between them), art style is amazing, recommended. Nice art. Shame it has some - ( in my opinion ) - bad messages and it wasn't a longer , better, more interesting story. For me , this game came across as really sexist and anti-fantasy even though it had fantastical elements in it and featured a female character. So disappointing. If more thought and care had been taken into considering how some people might take certain aspects / concepts inherent in the content , perhaps I wouldn't have issues with it. 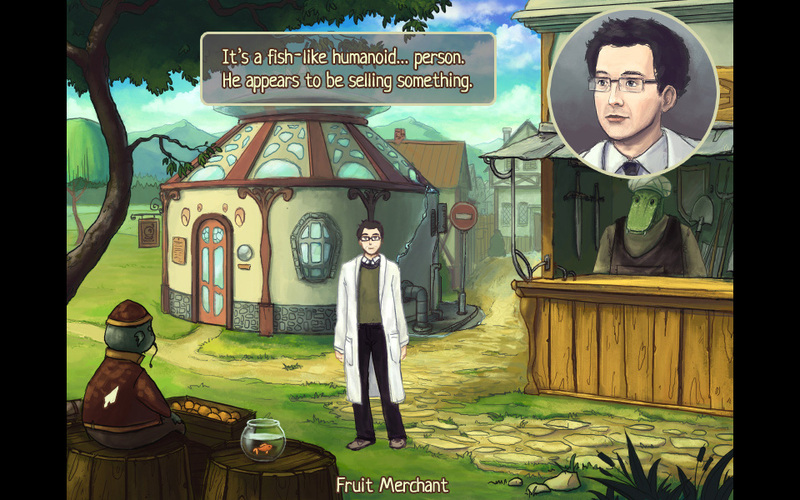 Good story, nice artwork, well defined environment, exotic theme, nice audio, perfect controls. This little but brilliant game is worth playing. Don't miss this. Beautiful, charming experience. I enjoyed every single moment of it! The art is superb, but animation slightly static (would have liked to see doors animate, plants sway in breeze and characters turn/scratch/blink a little). The rain sequence however was AMAZING! AGS never looked so good. Nice toolbar animation and use of transparency. Beautiful fonts too which really suit the theme. Some might prefer harder puzzles, but I prefer to keep the pace up, so it was perfect for me. I also found the music, sound, characters and writing all spot on. Patchwork is at its best when you keep the characters together to see how they comment on each other. There's some nice humour here. There's some nice transitions/variation in how the characters perceive the world, which keeps things interesting and is nice attention to detail. There's also nice detail in how things vary if you do things in a slightly different order, as well as characters needing a reason to do stuff. I'd love to see it expanded into a full length game, and would definitely purchase. The artwork, story and music were all just wonderful and completed each other very well. I really enjoyed this game, the overall production value was astonishing. My only criticism is that it's way too short, I want to play more in this game world! Very nice game. As pointed out, it might have been more fitting to make a slight difference in style between the two worlds. In this case I would have used other music for each player. But besides this, it was beautiful made and quite original as well. I enjoyed this little game, which managed to fit a lot into just a few scenes. The dialogue was nice and snappy but would have been helped no end by some voice acting - particularly the pixie! The puzzles were good and fitted with the story nicely. It was quite fun switching between the two main characters to solve some of them. Just about enough clues - any more and it would have been too easy, but any less and it would have been quite frustrating in places. I did not need to use the forum hint line at all. It's always a pleasure to play a game where you can work everything out for yourself. 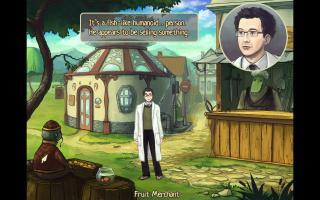 The graphics were attractive and fitted the storyline quite well, though perhaps the difference between the two worlds could have been emphasised a little more by using contrasted illustration styles. Overall I had a good afternoon's pleasure from it. Enchanting artwork and clever visual effects drive this short tale about a bit of science-magic gone wrong. Fantastic backgrounds from a fantastic artist! And the game is good too! Gorgeous. I would love to see a sequel. It's just too delicious for such a short game. If only this had been longer, it would have been among my all-time favourite AGS games. As it is, very well worth playing. I enjoyed this game and I had fun playing it.